Why Do the Blind and Paralyzed Pray to Saint Alice? Saint Alice was born in the year 1204 in a small village called Shaerbeck, which was near Brussels. She was sometimes called Aleydis, a common form of the name Alice in that time period. She had a very religious upbringing and at the very young age of seven, on her own volition decided to join a convent. The Camera Sanctae Mariae convent would be the home of Saint Alice from that day on, through her entire life, until her death in the year 1250. The Camera Sanctae Mariae was a Cistercian convent. Cistercian monks and nuns were sometimes referred to as the Bernardines or the White Monks. They believed in living a life of manual labour and self-sufficiency. Saint Alice fit in well because even at her extremely young age, she was known for being extremely humble and kind. She was influential to, and highly admired by the other nuns that she lived with. She led by example, performing her many selfless acts. Sadly, when Alice reached her teenaged years her life took a dramatic change. Saint Alice became stricken with leprosy. This meant that she would now be forced to lead a life of seclusion, as lepers were forced to do due to the highly contagious nature of the disease. This was a terrible fate for a young Alice to face. She loved nothing more than to be around people. She loved to help them, and talk with them. She was a leader by example. Now, leading a lonely life as an outcast from society, Saint Alice would have to figure out how to continue to be that light. Alice remained strong through prayer which brought her even closer to God. She was comforted by being able to receive the Holy Eucharist, though she could not drink from the cup. The Lord appeared to her and assured her that He was both in the bread and the wine. It was okay that she could not drink from the cup. Alice’s suffering did not stop at just leprosy. Saint Alice was also stricken blind only a year into battling her disease. She later became completely paralyzed as well. At this point most human beings would be so depressed and struggle with their faith. Anger would be reasonable, but not for Saint Alice. She remained positive and faithful. She continued to be comforted by receiving the Holy Eucharist and her visions of God. He came to her, telling her to remain strong in her faith. He assured her that she she would be welcomed into the kingdom of Heaven with, into warm, loving and open arms when the time came. Until then, while on earth, she must remain strong. Alice remained strong and faithful until her dying day in the year 1250. Though she spent her time isolated from others, she remained at the convent and enjoyed a close and special relationship with God. Her strength and faith is an example to us all. She is a special example to the blind and paralyzed. 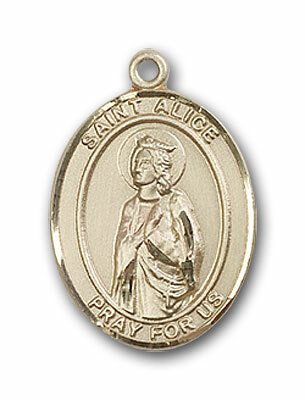 When praying to Saint Alice, their patron saint, they remember that Heaven is waiting for them. They must be strong and faithful. Saint Alice was Canonized in the year 1907. Her feast day is June 15th.